As requested, here are two real case studies of ClickFunnels! BassBuds is a premium brand which sells premium headphones to musicians, artists and DJs. So the first thing you’ll notice on their pre-sell page is their background video which will begin playing. The video has been well-crafted with a bit of background music which suits the theme of the entire page. Being a more premium product, highlighting the product’s unique features on the page is a great way to setting the mood for the buyer or prospect to take the next action. The background video is a parallax which you will be able to notice as you scroll down the page. The strongest part of the page is its consistency with its branding and colour. Using the colour palette, you’ll notice that the dark yellow colour is maintained throughout the page (and even onto the following pages). If you visit my previous post on funnel hacking, you’d be able to use a tool like Ghostery to identify that the page also uses retargeting platform AdRoll and analytics tracking like Google Analytics. Back towards the top of the page, you’ll see the toolbar is also slightly transparent which works really well because the background video is able to sneak through to the front. The optin button on the first page is also included on the page with a very sleep border around the section to make it stand out on the page. Just below the optin area of the page, BassBuds includes some very powerful social proof with some extremely well known artists holding their product. On the second page of the optin funnel, visitors are taken to a thank you page. Although the page is very simplistic, it also perfectly serves its purpose and connects with its target market. 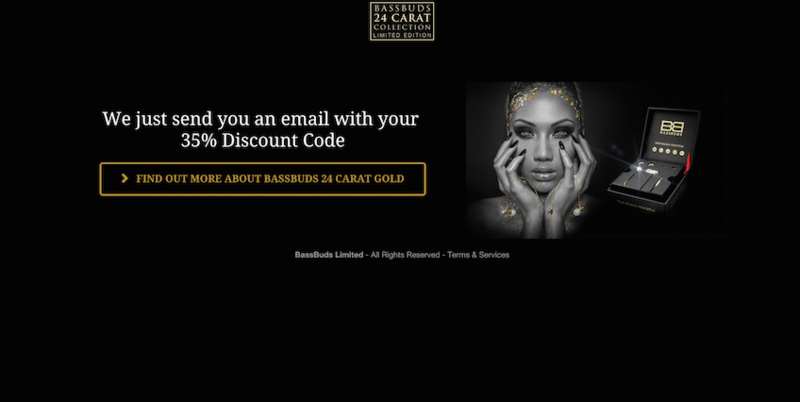 It continues the look and feel from the first page of the funnel, alerts the new prospect that they should check their email for their discount code and also gives them a call to action to head to the BassBuds store to find out more. Marriage Solutions is a marriage counselling company which offers in person counselling with people struggling with their marriage at various different levels. By segmenting their audience, they’re able to tailor their message, follow up series and more to their laser targeted market. Additionally, using four buttons to segment their traffic also is a lower barrier alternative to the optin box found below. The colours used are really congruent with the logo and look & feel of the brand, which create a really welcoming aura. As soon as you arrive to the page, the video is also set to autoplay which means that the story-telling begins from the first second people enter the funnel. The social proof on the page is also extremely powerful with a topic that is so personal. This opens a video sales letter above the fold, alongside an optin box to watch the 3 orientation videos followed by booking an appointment. As you can see below, the 2nd page also goes into detail into what the value will be within the three videos that they’ll be opting into watch. The transparency and congruency between pages also builds up trust and rapport with the visitors (although not statistically measured). The third page of the funnel is the beginning of the video orientation series where the visitor consumes the value offered. With a nice addition of the timer on the page, the button to continue to the next step appears just as the video concludes. There are two more pages very similar to the one above for the two other videos too before the prospect arrives to the 6th page in the funnel where they’re directed to book in a consultation with the company’s therapists. 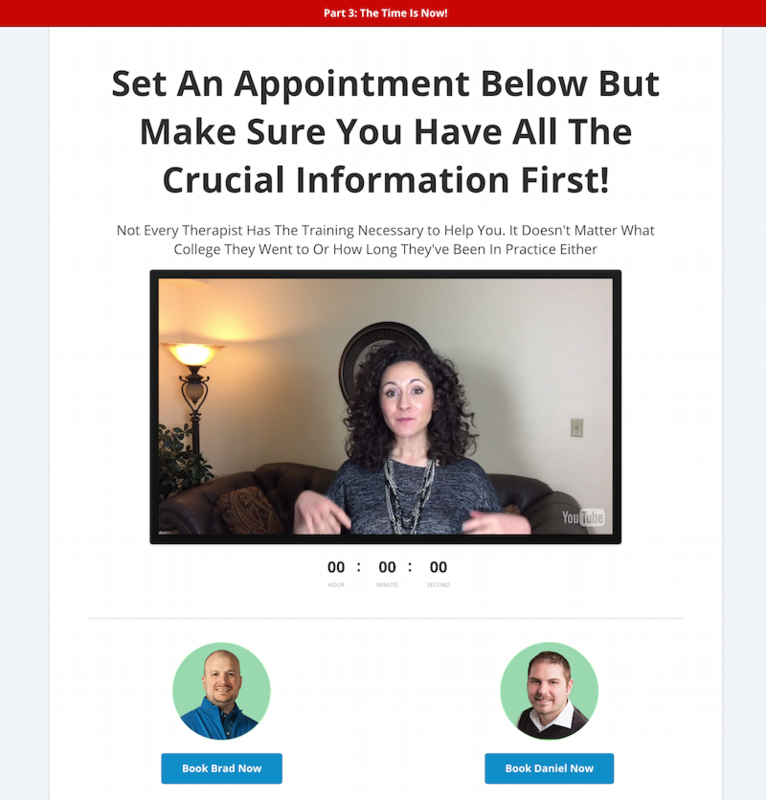 On the last page of their funnel, Marriage Solutions uses a video at the top of the page to call to action their two therapists for a booking. The ultimate goal to place a booking has been seeded through previous videos which makes the message very powerful once the prospect has arrived to the final page. Below the link to the booking buttons are the prices per consultation with the therapists using the pricing element found in ClickFunnels, as well as payment plan options if the client needs an alternative too. Towards the end of the page, there is also some general objection handling videos to reassure people in different situations who still may be unsure about the decision to proceed with a booking. Overall a very strong funnel which really speaks to the target market and breaks down their problem through segmentation and great value. Thanks for reading and comments are welcome!